References: Paula Piilonen, unpublished results; Horváth specimen collected in 2011 confirmed by XRD; Blass, G. & Tremmel, G. (2014): Neptunit und weitere neue Mineralien aus den Phonolith-Steinbrüchen von Aris, Windhoek. 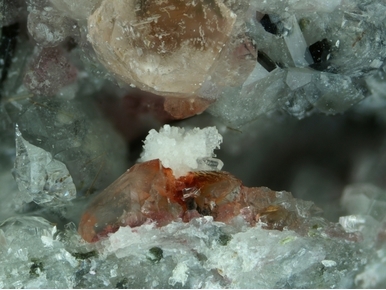 Mineralien-Welt 25 (1), 76-83 (in German); Kolitsch, U., Blaß, G., Jahn, S., Cámara, F., von Bezing, L., Wartha, R. R., Tremmel, G., Sturla, M., Cerea, P., Skebo, M. and Ciriotti, M. E. (2016): Aris - mineralogy of the famous alkaline phonolite. 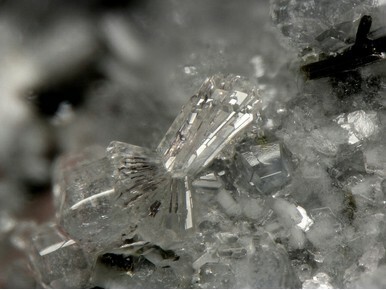 AMI - Associazione Micromineralogica Italiana, Cremona, Italy, 95 pp. 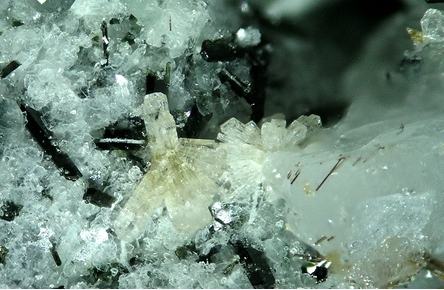 Villiaumite ⓘ2 photos of Thornasite associated with Villiaumite at this locality.